It’s snowy here in the Comox Valley and things are starting to look very much like Christmas! We hope everyone has a safe and merry holiday this coming week filled with family, friends and Christmas spirit. A couple weeks ago I helped my Mom out in her elementary school class while she taught all the kids to make wreaths. All the children came ups with such individual and festive wreaths, I was so impressed what they could do in such a small time frame! My mom sent me the photos she took of the kid’s finished products and the photo presentation she made of our ‘practice’ wreath which we used as a tutorial for the kids. Even though it isn’t sewing related, I know most people reading sewing blogs enjoy a tutorial, so here is the presentation as a quick wreath making tutorial to help you get into the Christmas spirit! 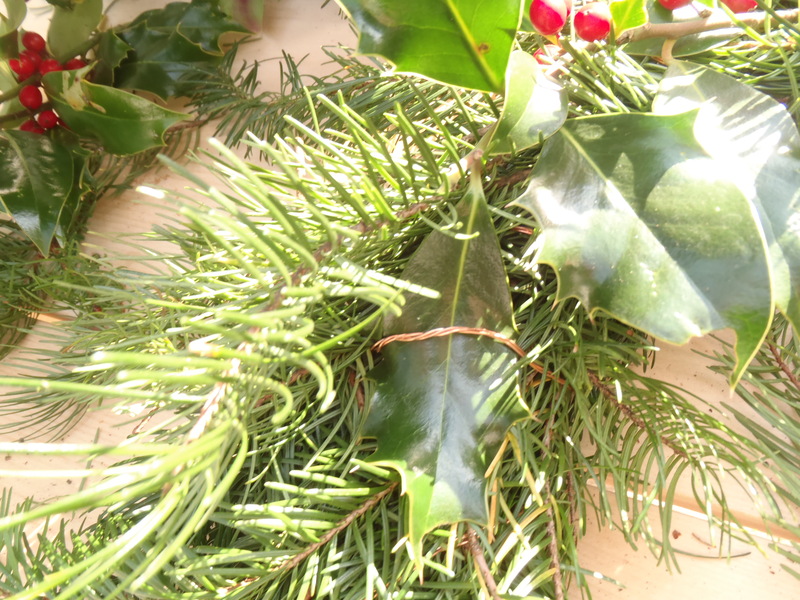 What results is a natural and rustic wreath that is cheap, smells beautiful and looks nicely home-made! Enjoy! 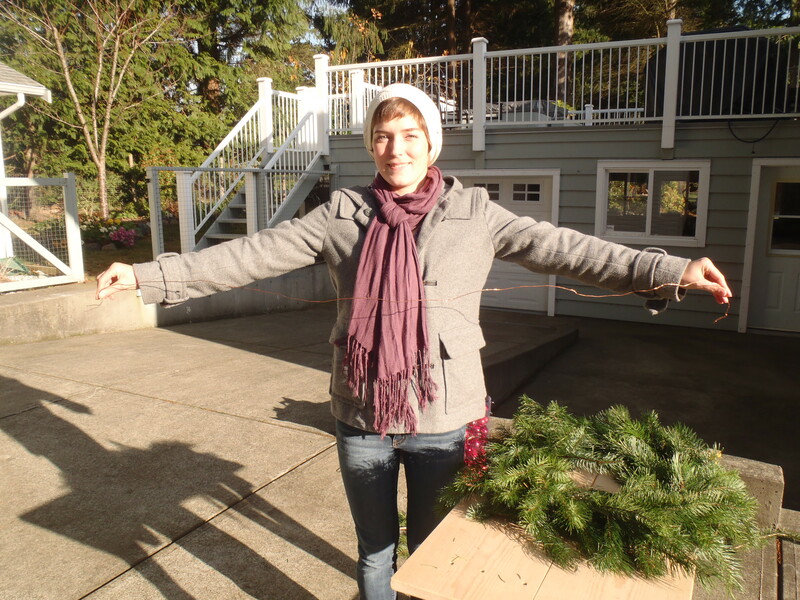 Step 1: Bend the clothes hanger until it forms a circle to become your wreath form. 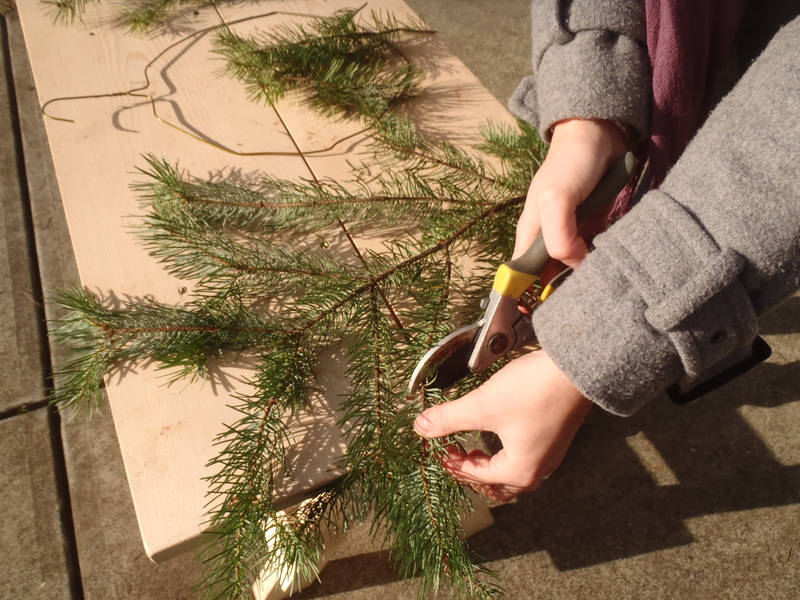 Snip branches into various sizes ranging from 1 foot long to small 5″ twigs. 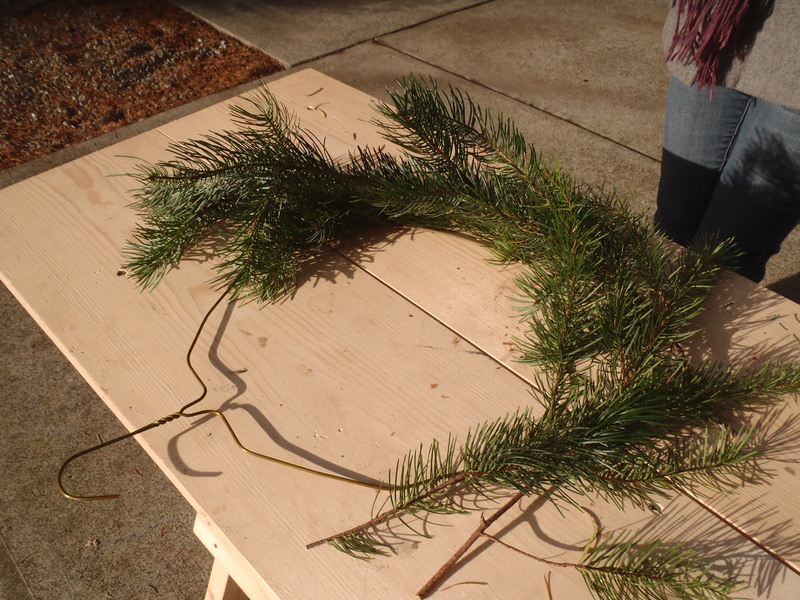 Step 2: Place the wreath form flat on your work surface and lay the branches down on top of the wire to form a rough circle. 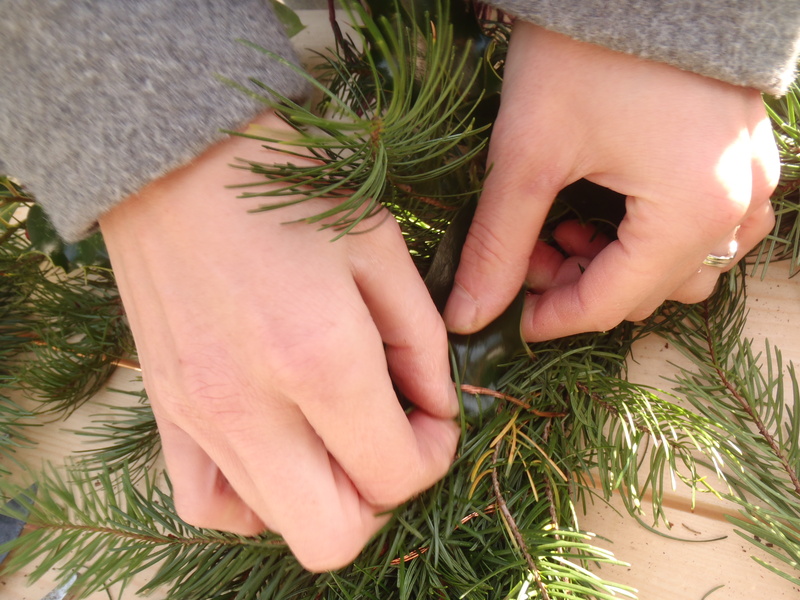 For a smooth wreath, lay all the branches in the same direction. 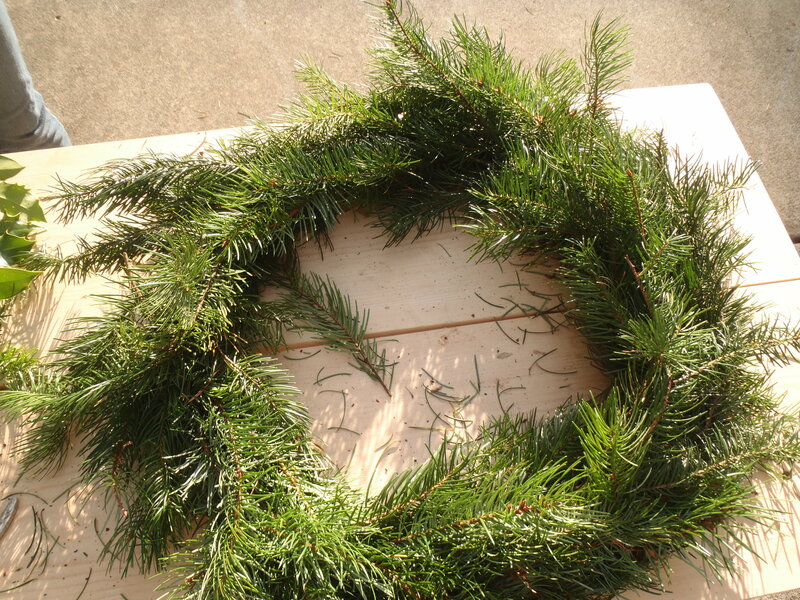 For a more rough and rustic looking wreath, place branches in any direction. When placing the branches, hid the thick twiggy ends underneath green foliage. 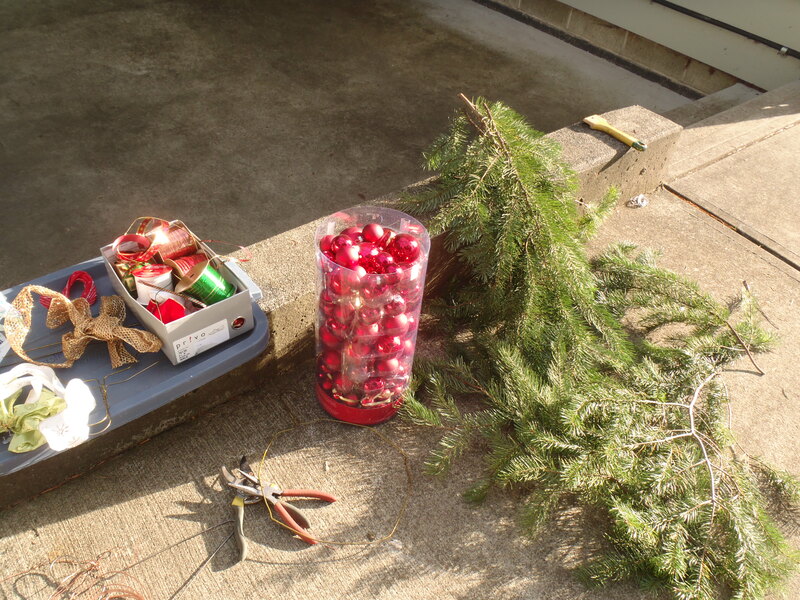 Step 3: Add decorative greenery such as holly or pine cones. 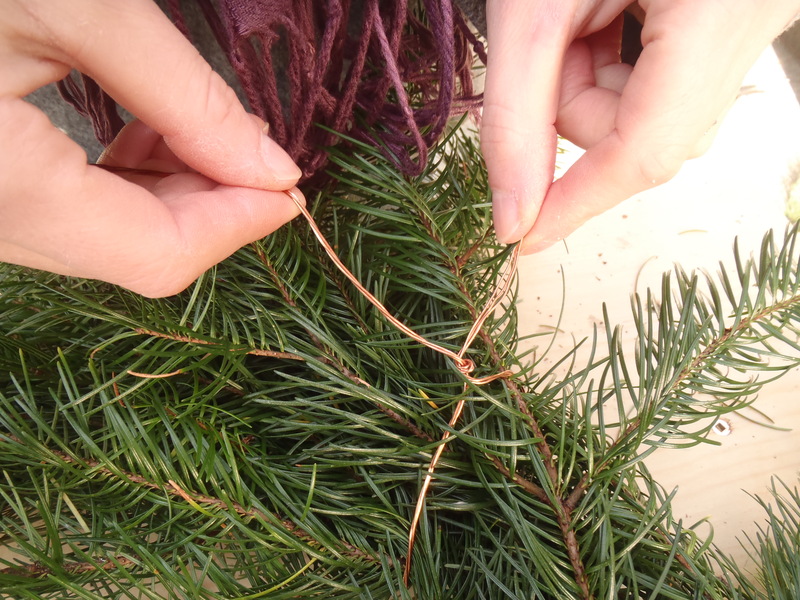 Step 4: Cut an arms length of wire to wrap around the greenery and hold it to the wreath form. Step 5: Secure your wire by twisting as though it were a twist-tie. 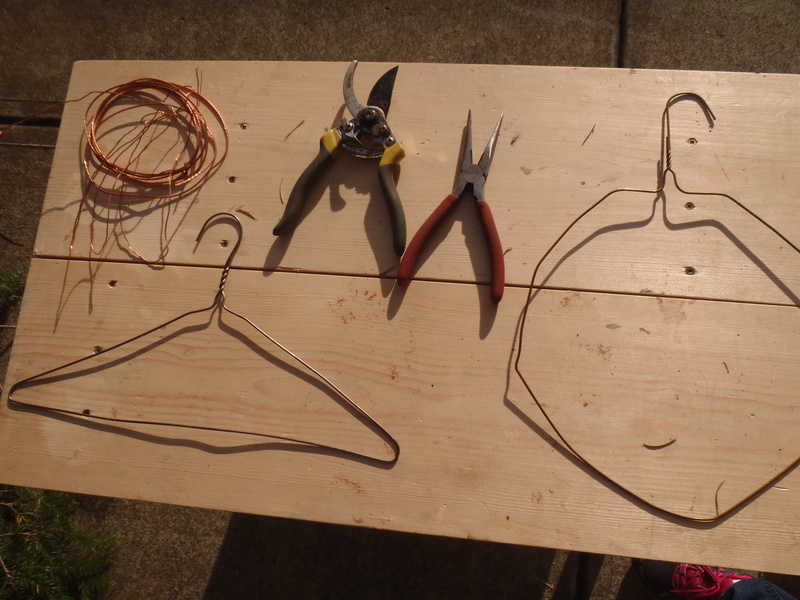 It is easiest to secure the wire around the hanger’s hook rather than around the greenery (not pictured…we did it the difficult way!). 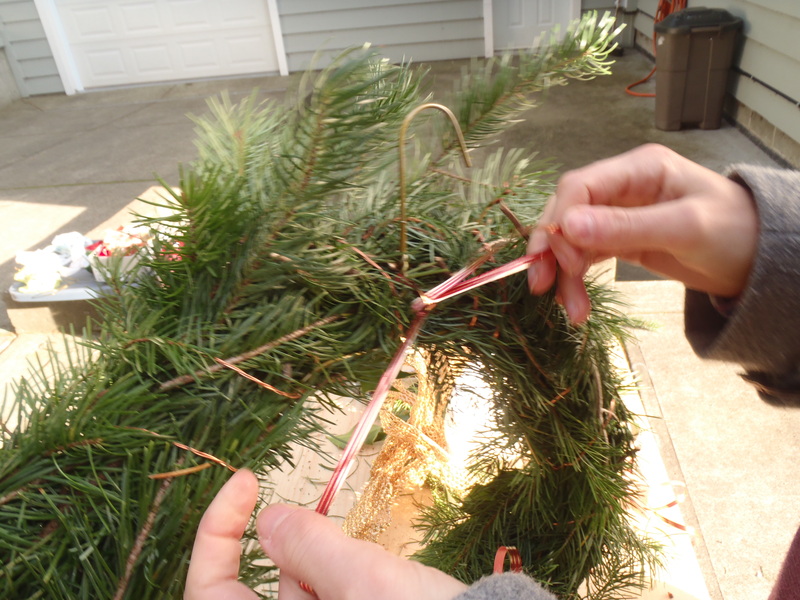 Twist the wire tightly around the greenery and metal wreath form. If your run out of wire, add more wire to your length by twisting the ends or a new piece onto the old piece. Finish wrapping your wire once you meet up with the beginning twist and again twist the end of the wire to the hanger’s hook. Step 6: Camouflage the wire wraps by pulling out leaves and branches just enough so that the wire is covered (but don’t get too enthusiastic with your pulling or your branches may come loose from their wire wrap!). 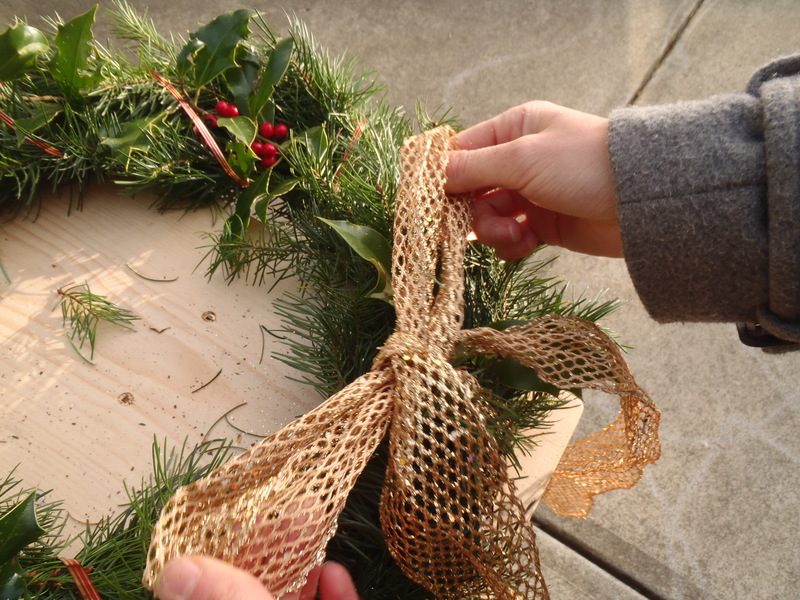 Step 6: Decorate your wreath. 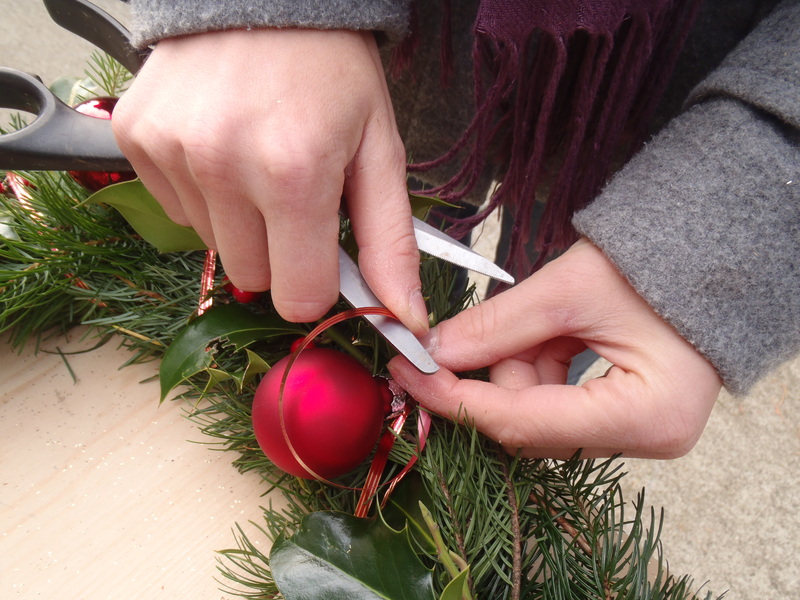 We used ribbon to twist around the wreath in the same manner as the wire. Lastly, we used ribbon to tie on some glass ornaments (one of which I promptly broke) and curled the ribbon ends with scissors. 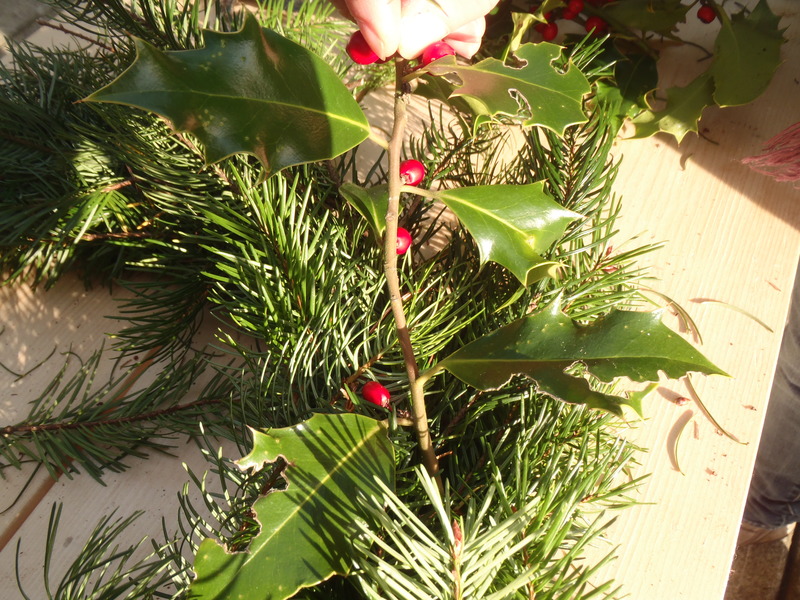 Hold your wreath at arms length to check if there are any bare spots or fly-away branches. 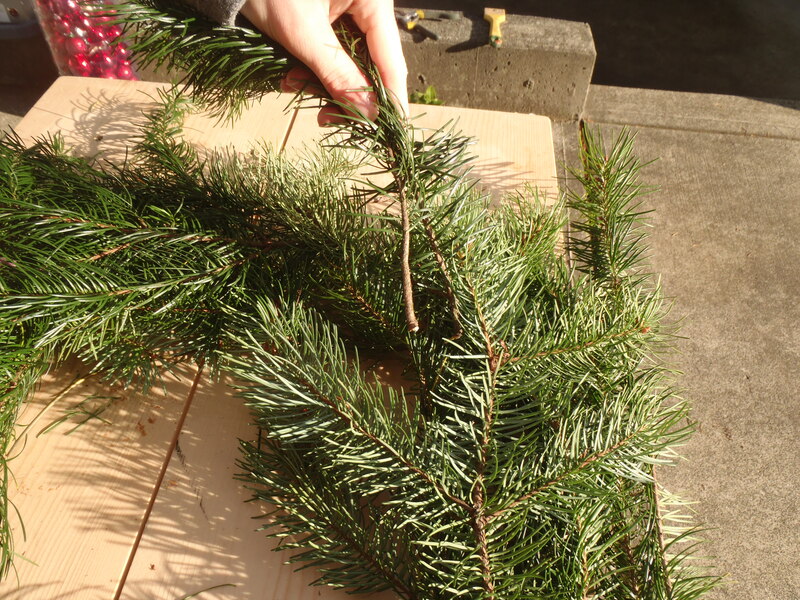 Fill in with extra branches or trim them away accordingly. 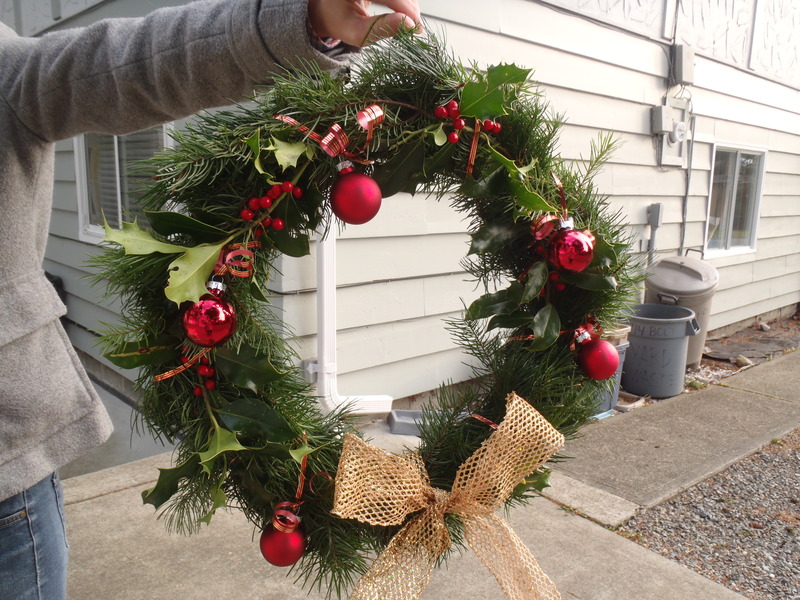 And now you have a nice home made wreath to hang on your door for Christmas! It sure beats buying one from the grocery store for $20! 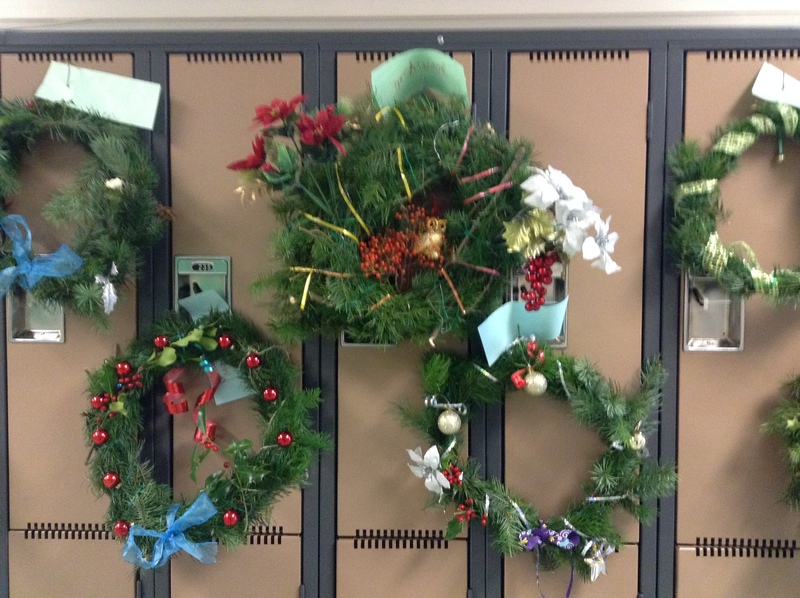 Below are a couple shots of the kid’s wreaths. They were so proud of them and the younger kids were in awe. A couple teachers took their classes on a walk by to have a look at them – there is nothing that creates Christmas spirit more than watching a class full of kindergarteners walking hand in hand by the Christmas wreaths and positively shivering in anticipation for Christmas! Have a lovely holiday everyone! And thanks for inviting me into your class for the Christmas project, Mom! 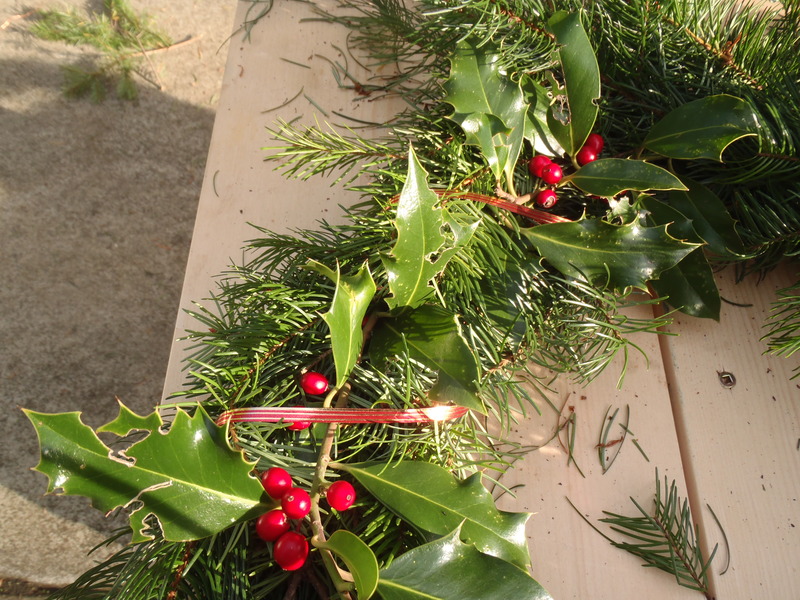 Categories: Friday Posts, Tutorials | Tags: Christmas, wreath tutorial | Permalink. OMG! just discovered you guys and thrilled to have done so! I love that you have started to tackle to lack of mens sewing patterns head on! Personally, I’m not keen to sew with knit/jersey fabric, but looking forward to the release of the peacoat pattern… will deffo be giving that one a go! I’m also a massive fan of Merchant and Mills here in the UK and have purchased loads of my fabric and notions from them! If they’d diversified into mens patterns then i’d have been a very happy bunny! They have, however, contributed to an obsession with oil cloth! Mmmm – I love how it distresses with use…. I’m glad you found us and thank you for your enthusiastic comment! I would love to try sewing with oil cloth, I haven’t yet but really admire what Merchant and Mills does with it. One of the women in my fashion design program last year created her own oil cloth to use for rain coats – they were amazing and I would like to try doing something similar one day! I look forward to seeing your pea coat when the time comes! What a nice project! The wreaths are beautiful and the kids will never forget making them. Lovely wraiths …. I note how many schools are banning such displays as they may offend some �others�. It�s heart warming to see it�s going on where you are. Nice display and nice message.